Photos and story from the “Capturing Collective Memories” Library – The following historical piece was written by Lee Darrach (1916-2000), son of Hector Alexander Darrach (1883-1971). It offers us insight on how farms along the Clyde River supplemented their income by fishing on the Clyde River and adjoining West River. Hector Alexander Darrach was born on his father’s farm in Clyde River on September 8, 1883. (editor’s note: his father’s farm is currently owned by Sidney Poritz.) His great grandfather, Duncan Darrach emigrated from Scotland to this country and is buried in the Pioneer Cemetery, St. Catherines. His father, John Darrach and his grandfather, also called John, are buried in the Clyde River Presbyterian Church Cemetery. There were eleven children in this family: Florence Catherine, John Duncan, Neil Archibald, Frances Catherine, Daniel John, Lee Grant, Hector Alexander, Angus Fulford, Isobel Jane, Eldon J., Lillian May. Florence married Samuel Ross, a building contractor and they settled in Dorchester, Mass. John married Beatrice MacDonald and they made their home in Quincy, Mass. Neil married Dicey MacLean and they settled on a farm in Clyde River. Frances married Frederick Beer and they made their home on the Bannockburn Road. Daniel never married and moved to Western Canada and worked on the railroad. Lee married Lottie Dixon from Bannockburn Road. He was a carpenter by trade. Hector married Ina Beer from Bannockburn Road and they made their home on a farm in Clyde River. Fulford was married twice, first to Ethel MacLaughlin from Clyde River and then to Ethel Berry from Nova Scotia. Eldon married Margaret MacPhee from New Haven and they made their home in Brandon, Manitoba. Isobel and Lillian died in their infancy. Hector Darrach attended Clyde River school and as a young man purchased an adjoining farm to his father’s farm and married Ina Mary Beer, daughter of James Beer from Bannockburn Road. There were six children in this family: Maggie Jane, Amy Ann, Saida Elizabeth, Frederick Boyd, Ina Mary and Mamie. Maggie married William Younker and they made their home on a farm in Kingston. Amy married a Mr. Mayhew and they farmed in Clyde River. Saida married Wesley Hood and they settled on a farm in Cornwall. Frederick married Frances Darrach from Clyde River and they made their home in Bannockburn Road. Ina married Hector Darrach and they farmed in Clyde River. Mamie died at the age of two years in 1896. Five children were born in this family: Hector ‘Ralph’, Margaret ‘Marie’, John James, Lee Daniel, and Amy ‘Joyce’. Ralph was twice married, first to Jean MacLeod, from Milton and Della MacLeod from Long Creek. They farmed in St. Catherines. Marie married Wilfred Stretch from Long Creek and they made their home on a farm there. John married Marguerite Crosby and they farmed in Clyde River. Lee, the author of this biography, married Eleanor MacFadyen and they made their home in West Royalty. Lee worked for the Civil Service. Joyce married Norman MacKenzie from Long Creek and they settled on a farm there. Hector built a new house on his newly-acquired land and farmed there successfully for most of his life. Growing up on this farm in the ‘twenties’ was little different from that experienced by others on adjacent farms. The completion of farm chores was required of us siblings. Weeding and harvesting of farm crops and caring for farm animals, all required hard and often tedious work. If drudgery was a part of farm work during the summer, the autumn and winter months of the year were a far different story. The location of our farm at the confluence of the Clyde and West Rivers gave us the opportunity to participate in three off-farm activities that were of great interest to us as well as supplementing farm income. These activities were the oyster fishery, the smelt fishery and mud digging. In the autumn of each year, oyster fishing dories would arrive at our shore to begin this annual fishery. Many farm owners and farm workers as well as fishers from as far away as Charlottetown participated. The Charlottetown fishers constructed shacks and ate and slept there during the fishing season that lasted for approximately two months. Oysters were hand raked using oyster fishing tongues from and along the channels of the Clyde and West Rivers with the greatest effort being made during the low tides. At this time upwards to one hundred dories fishing these channels so close to each other that from a distance they appeared as a long black line. At high tide the fishers could be observed at the shore culling their catches in their dories. What a delight it was on warm autumn days to watch these fishers work on their catches, to sample these delicious shellfish and to row a dory up and down the calm waters along the shore! I particularly remember the Biso family from Charlottetown, Thomas and his two sons Wilfred and Peter. Although Thomas was one of the older fishers, he could rake more oysters than most others despite a permanent injury to one of his hands. 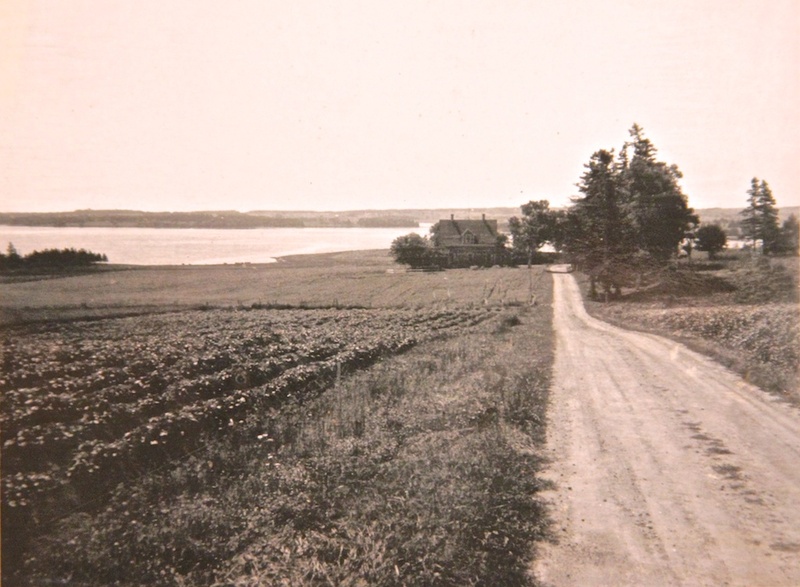 Some Friday nights my father would drive the Biso family to their home on Riley’s Lane, Charlottetown. Sitting in the back seat of the Model T Ford on that trip to Charlottetown, despite the cold, was the most interesting time of the week. Mrs. Biso would have sausage sizzling on the coal fired stove and these along with “store bought” bread provided a welcome change to our usual humble fare of “home made” bread and potatoes. Every week Charles Earl of Earl Fisheries from Charlottetown with his helper, a Mr. MacRae, would arrive at our farm yard with their truck to buy the oyster catches which were taken up from the shore in bags. The oysters were emptied into a “measuring” barrel provided by Mr. Earl. Mr. MacRae who was a powerfully built man would shake the barrel as the oysters were being dumped in much to the displeasure of the fishers who could see their returns for their hard week’s work diminish with each shake of the barrel. They received ten dollars for each barrel. Experienced fishers could rake in excess of one barrel of oysters each day. The fishing of smelts was carried out on the Clyde and West Rivers commencing each season as soon as the ice formed – usually about Christmas time. Each ”enterprise” laid claim to one or two of the same “berths” year after year and their claims were usually respected by the other “enterprises”. Each “enterprise” usually consisted of one fisher, two brothers, or a father and son. The spacing between each “berth” was laid down by “regulation”. Disputes over “berths” were not uncommon. Clayton Shaw, the fishery officer from Charlottetown, would be summoned to arbitrate between disputing parties. Smelt fishing nets were constructed of twine with a mesh size fine enough to retain the fish and were commonly referred to as “bag” nets. The mouth of the net when open and held in place was rectangular in shape and measured approximately twenty feet by eight feet. The bag and trap extended back from the mouth some twenty to thirty feet. The far end of the trap could be opened to allow the catch to be removed from the net. The net was held in position in the channel of the river by two large poles each fitted with two iron slip rings and sharpened on the large end of each. Two holes were then made in the ice the width of the net apart. The top and bottom of the mouth of the nets were fastened to the slip rings, the poles placed through the holes in the ice, and firmly anchored in the mud of the riverbed. Much smaller poles called “set” poles were then fastened to the bottom slip rings thus enabling the mouth of the net to be opened and closed from the surface of the ice. A narrow opening in the ice between the two poles was made to allow the net to be placed in the water and to be hauled out of the water to remove the fish from the trap of the net. When the net was not “set”, the mouth was held closed by fastening the bottom slip ring to the top slip ring at either end of the net. To set the net, the set pole, which was fastened to each of the bottom slip rings, was pushed downward. The net was set at low tide by opening the mouth of the net to fish the incoming tide. The mouth was left open for three to four hours and then closed by pulling up the set poles. The net was hauled out through the narrow opening in the ice and the catch removed from the trap. The net would then be placed back in the water and would be set again on the next tide. Catches varied from a few pounds to a few hundred pounds. At our “enterprise” which involved two “berths”, the catch would be taken by horse and sleigh to the farmyard and spread on ice until frozen. They were then graded and packed into containers for shipment to the Fulton Fish Market in New York City. Prices varied from five to ten cents per pound. Because of the nature of tides, smelt fishing was carried on at various times of the day or night. During the nighttime, the sight of the fishers with their lanterns moving from their homes to their berths on the river to set or haul their nets was not easily forgotten. During the latter months of the winter season when the ice was at its thickest the mud digger would be hauled out over the ice to the channel of the West River. A hole would be cut in the thick ice to allow the heavy iron “fork” to be lowered to the mussel bed at the bottom of the channel. By means of a capstan and cable, the fork with its load of mud would be raised to the surface of the ice and deposited into a waiting wood sleigh. Power to the capstan was supplied by horsepower. It was so interesting to watch the horse as he circled the capstan, cutting into the ice with his iron clad shoes making a circular path that became ever deeper as the work progressed. The mud was transported by horse and sleigh to local farms as well as to farms miles away. The bounty from the river provided provender to our household. The clam and oyster chowders and the pan-fried smelts made many delicious meals. Waterfowl were abundant during the autumn months on these rivers and creeks. These waterfowl afforded recreation as well as meat for the table. It is somewhat ironic that in our affluent society these foods, which were free for the taking, are now considered a luxury not affordable by people of average income. Looking back over the years the memories of growing up on the Darrach farm are fading now but things will never be the same. It is very unlikely that oyster and smelt fishing and mud digging will ever again be carried out on these rivers. But fond memories of these farm activities will still remain. Many years have now passed and upon reflection I think the poet John Bannister Tabb expresses my feelings best in his poem entitled “Childhood”. 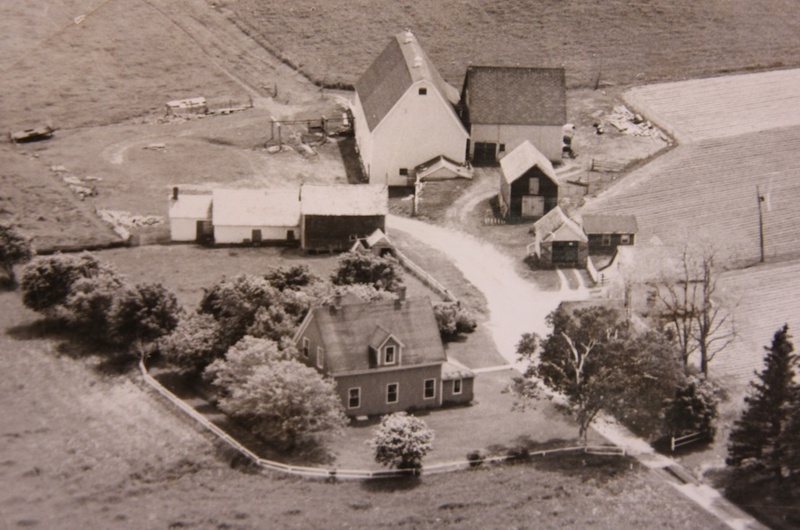 Aerial view of Hector and Ina Darrach’s farm – house and buildings are no longer there.